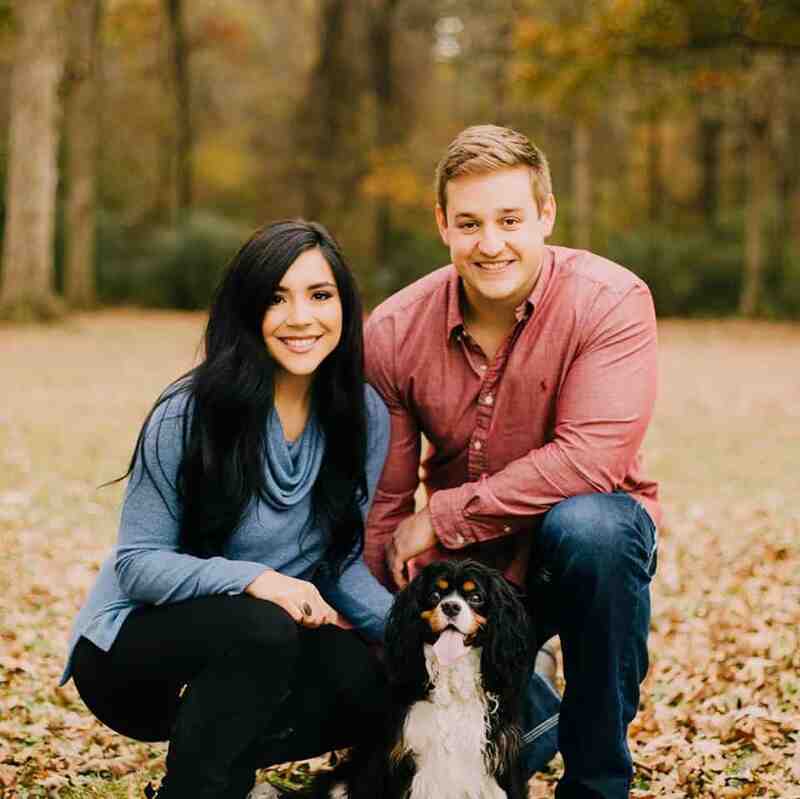 If you’ve heard me speak in videos or on Instagram, it’s clear I’m a born and raised southerner. That’s why I love making healthier versions of southern comfort foods, Tex-Mex, and other staples of the Deep South. 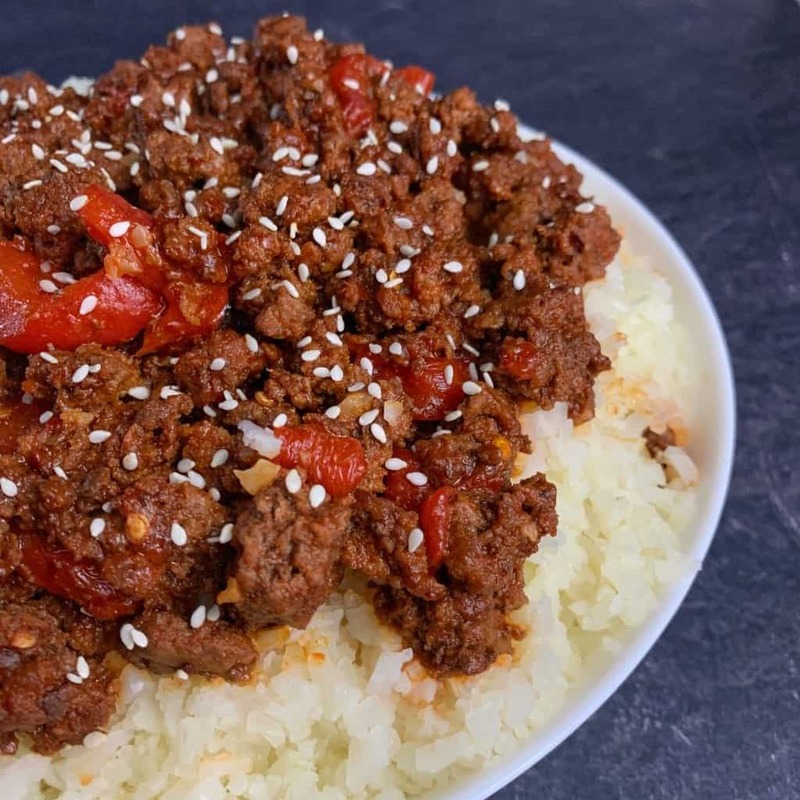 I say that to let you know this Korean ground beef recipe is outside my comfort zone, but I like to think I’ve done it justice. 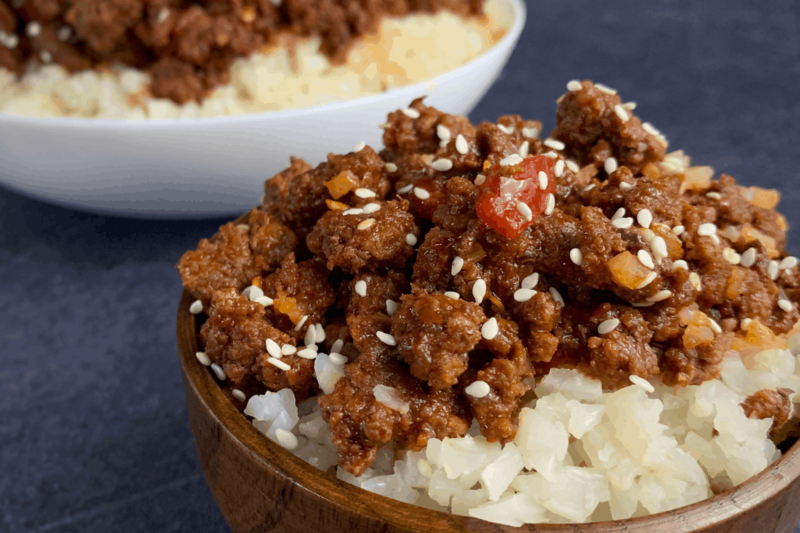 With only seven ingredients, this Korean ground beef sticks to my simple recipes with short ingredient lists modus operandi. And as always, each serving is packed with protein. 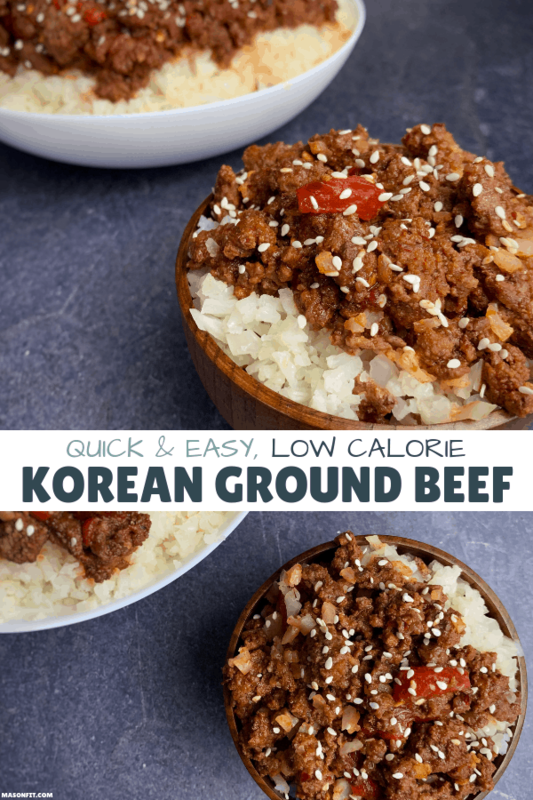 If you divide the Korean ground beef into four servings, you’re looking at: 201 calories, 25 grams of protein, 11 grams of carbs, and 9 grams of fat. Throw that down on a bed of steamed cauliflower rice, and you have a high volume, low calorie meal. Like I mentioned above, this recipe is super simple. Brown some ground beef, mix some ingredients in a bowl, and you’re done. Here’s a look at the non-beef ingredients. I doubt you have questions about the first four ingredients on the list, so let’s cover the Swerve and Gochujang. What is Gochujang and what can I use instead? Gochujang is a red chili paste with fermented soy beans and glutinous rice. It’s super thick, spicy, and slightly sweet. And I’ll go ahead and say it, Gochujang is one of the best tasting condiments I’ve ever tried. On a serious note, if you can’t find Gochujang (I found mine at Walmart, btw) you could try substituting chili garlic sauce, maybe sriracha, or you could use more crushed red pepper and a syrup of some kind. As for our next ingredient, Swerve Brown Sugar, a potential substitute I’ll mention is sugar free pancake syrup. That may kill two birds with one stone. And this may be the southerner talking, but I feel you could add crushed red pepper and a spice to tomato paste for a similar but less complex condiment. If you’re familiar with my sweets recipes like my chocolate cake protein donut holes, you know I’m in love with Swerve, a sugar substitute that’s made with erythritol and oligosaccharides. That’s a fancy way of saying it’s a calorie free sweetener that tastes amazing and doesn’t mess up your digestion or anything like that. I’m a big fan of their granular and confectioners sugars, but they recently added a brown sugar product and were kind enough to send me a bag. You can see in the video above, it’s like brown sugar for real real. I typically try to replicate brown sugar with sugar free pancake syrups since they have similar sweetened molasses flavor profiles. But having the ability to use a dry ingredient as opposed to sticky sweetener is awesome. I promise I’m not trying to sell you on Swerve! In this recipe, a sticky sweetener like sugar free syrup works okay since it’s going into a liquid mixture anyway. All right, that covers the brown sugar substitute, Gochujang, and mostly every ingredient question you might have. If you have a question, don’t hesitate to send me an email or DM on Instagram. A simple, low calorie ground beef recipe. Heat a large skillet with nonstick cooking spray over medium-high heat. Add the ground beef to the pan and use a spatula to break it apart. After the ground beef has cooked for 3-4 minutes, add the roasted red peppers. In a bowl, mix the remaining ingredients together until smooth. Add the sauce mixture to the beef when almost no pink remains in the beef. 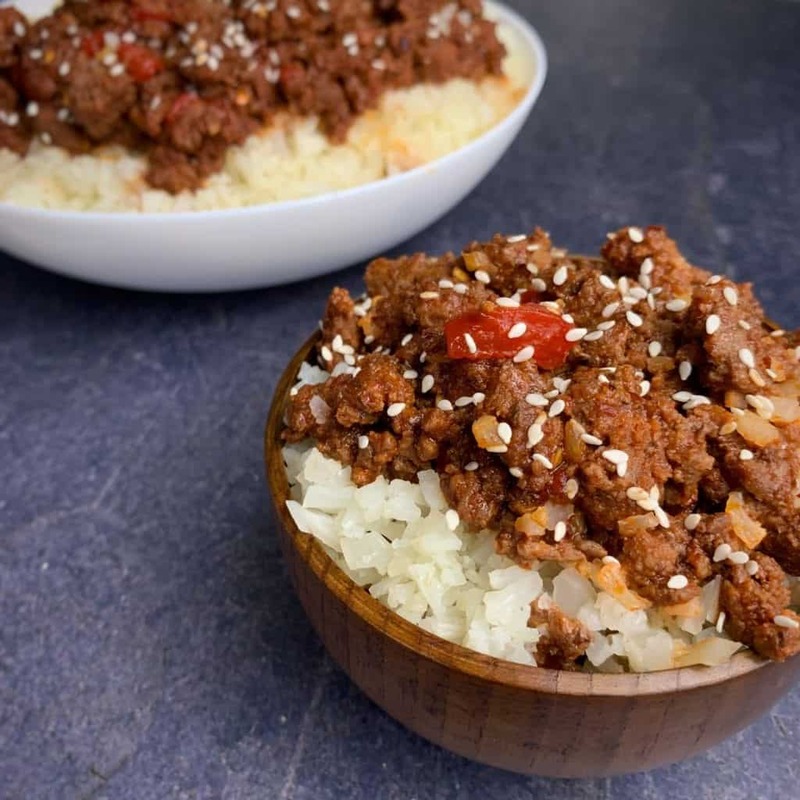 Serve the beef over rice or with mixed vegetables and top with optional sesame seeds. Macros do not include cauliflower rice or sesame seeds. To calculate the weight or measurement of your serving sizes, I recommend weighing the total finished recipe and dividing that weight by four. For more help with this, check out my guide to using a food scale for tracking macros. If you’re up for dessert, you should check out my free high protein cookbook for chocolate lovers. You can enter your info in the box below and I’ll send a copy to your email right away. Love Love Love your recipes! Wonderful …. substitute coconut amines for soy sauce. Loved the flavors. So good! A family favorite for sure!